ONLINE RESOURCES If you search for "Mary Solbrig" +aviation +mechanic, using the Google search engine, (11-17-07), you will find about two links, both of them well worth following. Solbrig Flying in Exhibition, Davenport, 1914 This page, also on the Iowa Pathways website, presents a beautiful photograph of Oscar flying his aeroplane in 1914. There is a short explanation of the event. For a very special treat, click the "NEXT" button below the picture. You will find a short video with clips of Oscar, Billy Robinson and a race between Eddie Rickenbacker in a car and Lincoln Beachey in an airplane . You can access the article by clicking on the title. Just when Mr. Solbrig became interested in Aviation is unknown; but records indicate in 1899 he had expected to go aloft with Casey Baldwin in his blimp. Chemicals used to inflate the blimp destroyed the silk envelope; so Oscar did not get his ride. Apparently the flight of the Wright Brothers kindled his interest to the point that he contacted several flying schools, finally deciding upon the Glenn Curtiss School on North Island in San Diego. A letter from the Curtiss Company dated Dec. 18, 1911 acknowledges his payment of $100.00 and advises Mr. Solbrig to report to North Island where Lincoln Beachey became a daredevil classmate. Later he attended the Curtiss Flying Boat School at Hammondsport. Upon returning home he built a Curtiss type flying boat powered by a 50 h.p. Roberts motor in which he made one flight. Reports indicate he had flown late in the afternoon and at dusk was unable to accurately determine the surface of the water and crashed upon landing. Only the Roberts motor was salvaged to be used in his next plane. 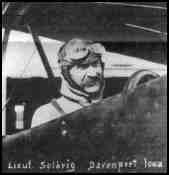 He decided that operation from land offered better opportunities, and a newspaper clipping of 1914 states Oscar A. Solbrig made a flight in his "humbly made plane" over the city from the Davenport Race Track. Immediately he began to contract for exhibition flights, transporting the plane by rail after it was disassembled and secured in its crates. He made the first airmail flight in Illinois when he took off from Rock Island and delivered the sack of mail by dropping it near the Davenport Post office. This plane which was built by him and his wife was soon replaced by a Curtiss Headless pusher which he used in future exhibitions all over the mid-west. He had purchased only half the machine and finished it at home. Later he decided he needed a larger plane and purchased a Benoist Tractor about 1916, but did not fly it much. Records indicate he found a good job which was much more lucrative than exhibition flying; so he put the Benoist and a cache of engines up for sale. Just when he retired from aviation is not known, but there are no clippings or family recollections of his having flown beyond 1916. He died in 1941 at age 71.